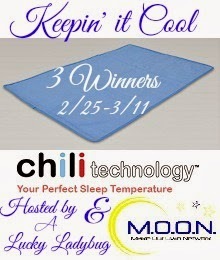 ChiliPad™ is part of a legacy of sleep innovations. The company is based around a second generation alternative sleep developer. Over forty years of alternative sleep solutions and there has never been a development to adjust for temperature. Temperature has not been something people could change in a regular mattress before, we have found the solution. Portable! Stay Cool and Comfortable Anytime, Anywhere! **If you are a company and would like to see your brand advertised in a M.O.O.N. event similar to this please contact MakeOurOwnNetwork@gmail.com. This giveaway is open to the Continental US only (because of shipping costs) and will end on March 11th, 2014.